Major update 2.0 (15.01.2019) is out! Gutenberg Styles and WordPress 5.x Ready! 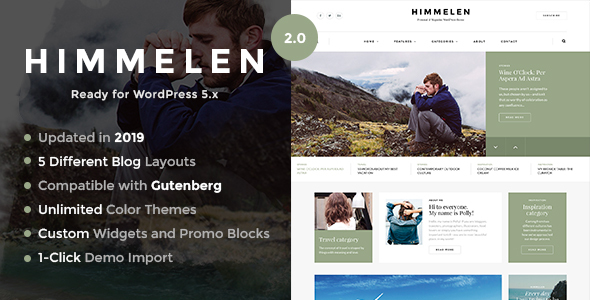 Himmelen is one of the most Elegant, Clean and Creative WordPress blog themes on Themeforest, now Gutenberg and WordPress 5.x compatible. Tell us your unique story about travel, inspirations, food, fashions news, photos, weddings and everyday moments from all over the world. Let’s make your blog the source of inspiration. This theme can be easily installed to start your personal or magazine blog within one click. Theme compatible with WordPress 4.x – 5.x, WooCommerce 3.x and WPML. And we make sure it will work with any future WordPress releases.